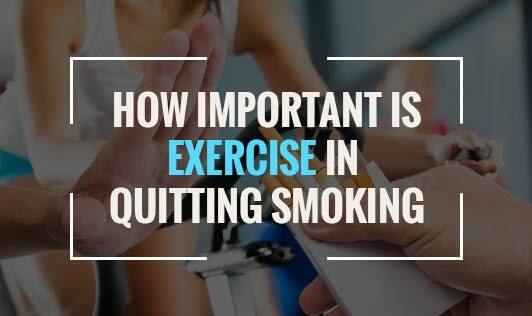 How Important Is Exercise In Quitting Smoking? Did you know that exercise plays an important role in helping you quit smoking? Research shows that smokers who take up a regular exercise program have a much higher success rate at quitting. The higher the level of activity, the higher the success rate. Smoking and exercise simply aren't compatible. Cigarettes do alleviate stress for many smokers. When you give up cigarettes, your stress level likely will rise. Exercise is an excellent stress reliever and can replace your dependence on cigarettes for stress relief. To get started exercising, you need to choose one or two activities that you enjoy. Common exercises include walking, jogging, biking, swimming, tennis, and basketball. You may even decide to undertake regular, strenuous yard work for your neighbors. Try to exercise 20 to 30 minutes at a time, three to four times per week. If you are out of shape, give yourself time to work up to this regular exercise schedule. Consult your doctor before beginning your exercise program. For many people, exercise is drudgery. Be sure you pick an exercise that you enjoy, and consider exercising with a buddy. Your buddy can encourage you to "keep moving" when you want to stop. You'll also be more likely to exercise when another person is depending upon you to be there.